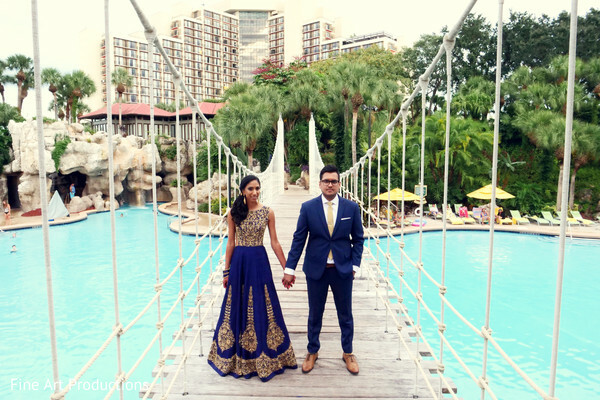 The charming private lake of the Hyatt Regency Grand Cypress was the perfect location for a gorgeous photo shoot previous to the reception. 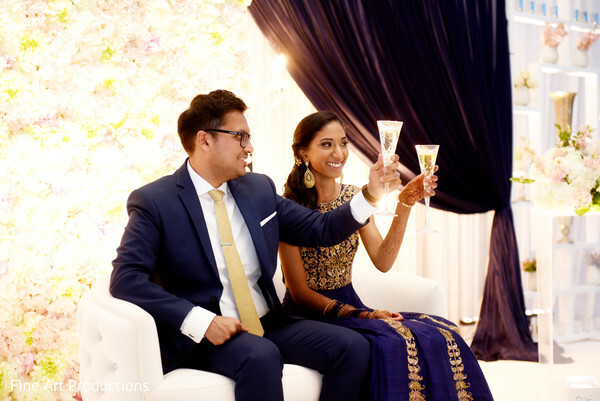 The regal-looking navy blue and gold outfit plus the sweet side hairstyle by Debra’s Do’s and Makeup Too made Neha looked picture perfect for the camera of Fine Art Productions. 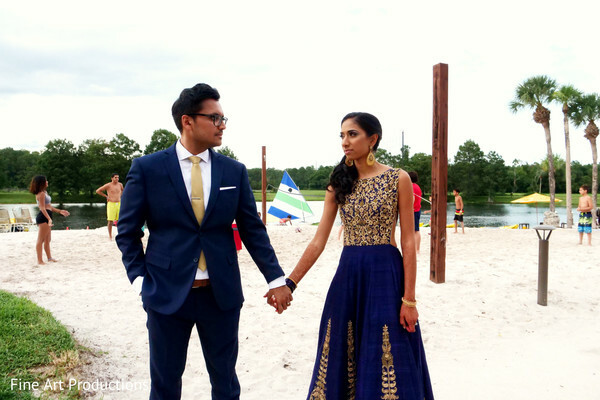 Meanwhile, her dapper groom Hemang added an extra charm to the duo with a very elegant blue suit. I can’t get over the fabulous stage that Myar Decor built for the occasion, with a fantastic backdrop and a lush floral wall that summed glamour and romance to the whole stage. 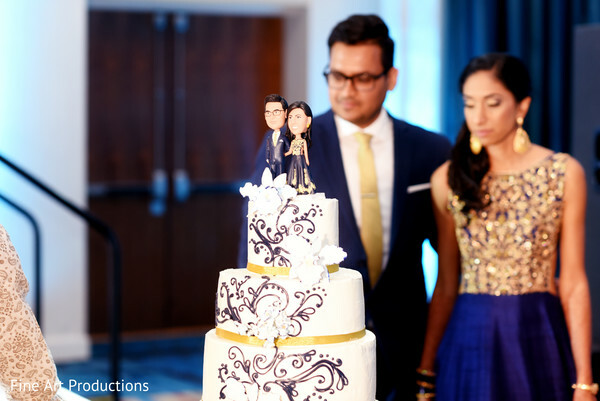 To personalized and coordinate the unforgettable night, Just Events Group was recruited by the smart couple to handle every detail while they enjoyed dancing with Prime DJs’ music and cutting a precious wedding cake that displayed a fully customized topper based on the bride and groom! How sweet! 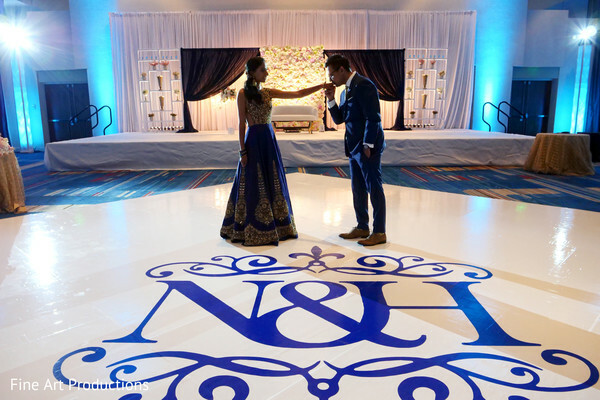 The high spirited celebration led by the newlyweds was a huge success chronicled in the gorgeous images that you will find in our gallery! Here I was thinking we were going on a mini getaway to Punta Cana to celebrate surviving my first year of residency...little did I know what really was about to happen. I wanted to walk on the beach as the sun was setting (setting myself up for the moment without Hemang having to do any extra work). We had made dinner reservations at a restaurant and needed to hurry. As we were walking down the beach enjoying the scene, Hemang kept loitering and was walking to an area of the beach that wasn't part of our resort! I kept telling him we will be late for dinner and that we needed to turn back around. Out of nowhere, he asked me if I was ready to deal with him forever. Deal with him making me late for dinner? Sure, I thought. Next thing I realized, he was fidgeting something out of his pocket and down on one knee! In a shell-shaped case, I see a ring sparkling just perfectly in the sunlight. He said all these nice things about me, but I, of course, I couldn't focus on anything but the ring. He asked I said yes, and the rest is history. Or so I thought. I turned around and a photographer popped out from behind the huts – he had been documenting the whole thing! I again reminded Hemang we were going to be late for our dinner reservation. As if that wasn't enough, on our walk back I see a table set up with candles and rose petals on the sand. As we walked by it, Hemang slowed down. I told him to keep walking, and that we were ruining someone's candlelight dinner on the beach. He just laughed at me and pulled the chair out for me to sit on. All of our vendors were fantastic and great to work with! I always wanted a traditional red color. I was unable to make a trip to India and thus had to get my outfits in the states instead. 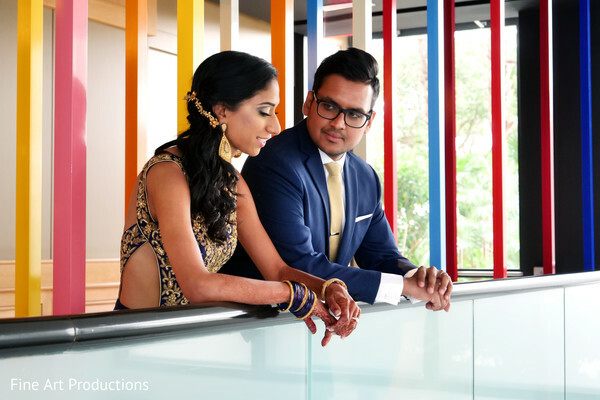 Binari Art made my customized wedding and reception outfits, and they turned out exactly how I had envisioned them. Highly recommend Ranisha Patel to any future brides. The most satisfying aspect of wedding planning was seeing all the small details we planned to turn into reality. We are fortunate to have great family and friends that worked hard during the wedding weekend to make sure everything went smoothly and reduce the stress on us. I felt like a princess all weekend! Some of our guests are still talking about the amazing food we had! I love watching our wedding trailer by Fine Art Productions - it truly summarizes the wedding events and I always end up with a huge smile after watching it. Myar Decor worked hard to make our vision turn into a reality. 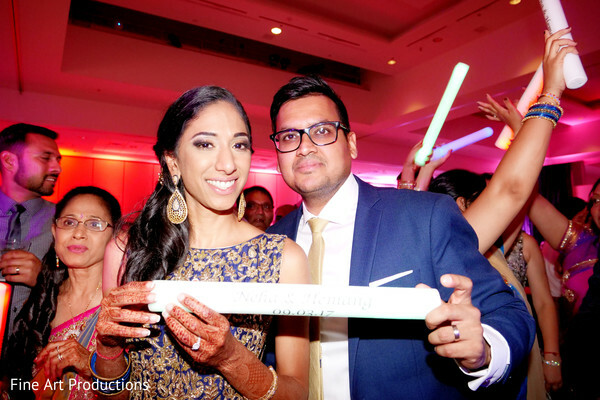 We were looking for a more traditional wedding and a modern reception style. 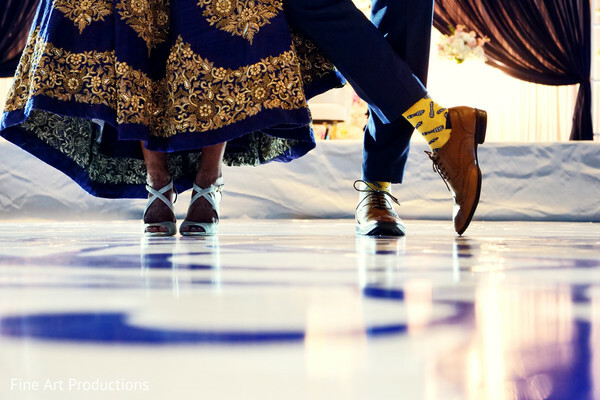 We had memorable dances from our talented family and friends that we still remember. 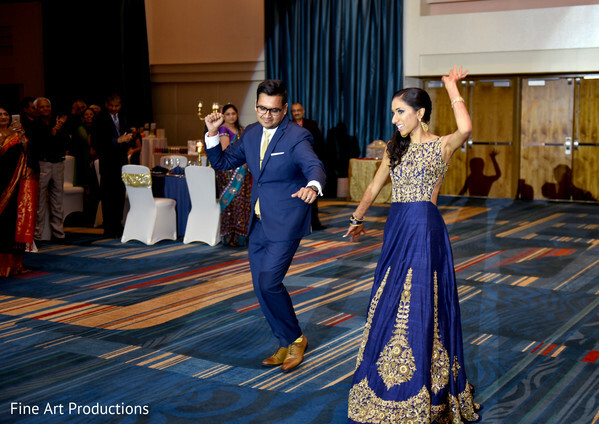 Our dance floor was popping the whole night thanks to DJ Anis which made our reception extra fun! 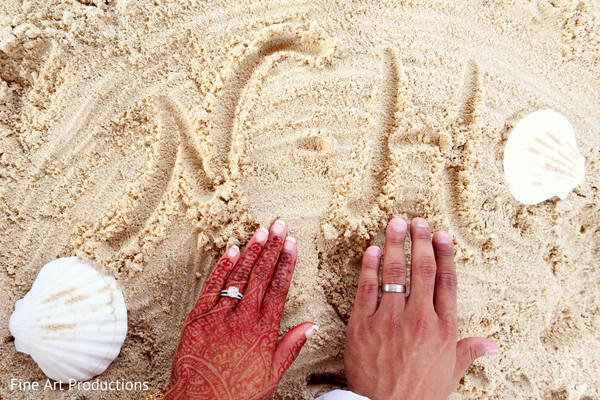 I hope your day is just as special as Neha and Hemang’s! See you tomorrow. Myar Decor is a member of the Platinum Guide. Love what you see? Explore their portfolios.